Send us your Streams and Creeks! In horror movie parlance, they’re baaaaack. 2006 photos of culvert pipes intended for Stone Creek. The Planning Commission mandated protection of the stream, which the property owner now seeks to have stricken. A Bel Air property owner is crying “abuse” and seeking to remove all references to Stone Canyon stream and, perhaps more importantly, stream protection from his 2006 development requirements. If this sounds familiar, you may have read about it in the Los Angeles Weekly story about my work, the Lost Streams of Los Angeles, which reported on this actual hearing. Or you may have seen this image of the pipe that was going to be laid in the stream at any of a number of talks I had given around town. 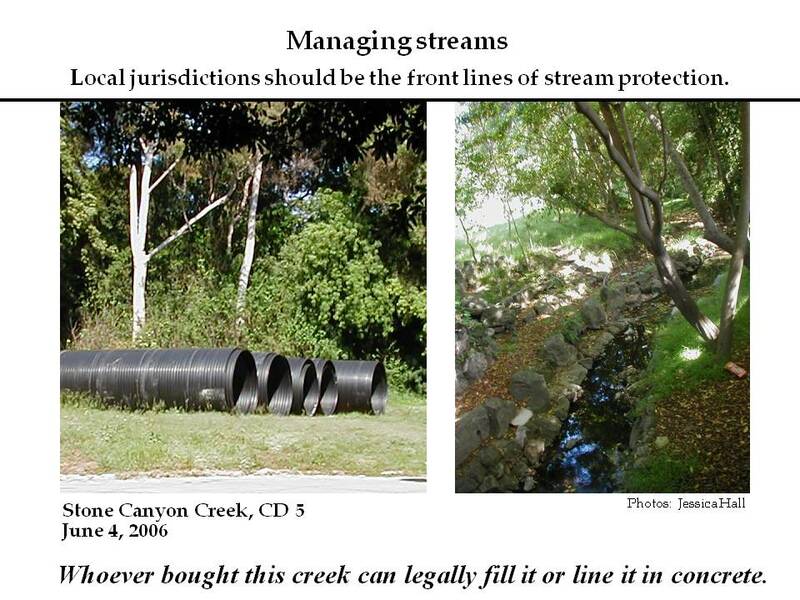 Indeed Stone Canyon Creek (and nearby Kenter Creek) has been something of the poster-child for the need for an overarching stream protection ordinance in the City of LA. The hearing takes place next week – Thursday, February 24, 9:50 A.M at City Hall Room 1050 (200 N. Spring Street, 90012). Congratulations: River Expeditions, Elmer Avenue, and more! > The California Stormwater Quality Association (CASQA) presented its Outstanding Stormwater BMP [Best Management Practice] Implementation Project award to the Los Angeles and San Gabriel Rivers Watershed Council for its Elmer Avenue Neighborhood Retrofit Demonstration project. Elmer Avenue is an excellent project – the kind that we creek freaks like to go and visit in the rain!! CASQA also recognized Santa Monica’s Bicknell Avenue green street, the city of Los Angeles’ Stormwater Public Education Program (which also received recognition from the National Association of Clean Water Agencies), and others. Read the full CASQA awards recap here. Congratulations to George, the Watershed Council, and the cities of Santa Monica and Los Angeles! LA creek restoration project goes out to bid! It’s not often that we can announce that a creek in LA is being restored – even more exceptional to pass along word that there’s a call for bids for qualified contractors to do the restoration work. Got some know-how in soil bioengineering, native plants, grading natural stream channels? Follow this link to get ahold of the bid packet. Bid walk’s June 8 at the site. Permeable pavement sidewalk at L.A. Eco-Village. When LID passes we should see more of these kinds of rainwater infiltration practices thoughout Los Angeles. Last Friday January 15th 2010, the Low Impact Development (or “LID”) ordinance was approved unanimously by the city of Los Angeles’ Board of Public Works. I recommend reading Spouting Off’s excellent coverage. First off, big props to Public Works Commissioner Paula Daniels who has spearheaded L.A.’s work on LID. There are certainly lots of other commissioners, city staff, non-profit folks (and even bloggers on the sidelines) who’ve done some worthwhile work on this LID effort, but Commissioner Daniels has really been the driving force on this one. She’s an articulate and committed environmentalist, a valued friend, and a true creek freak! Kudos to Mayor Antonio Villaraigosa for appointing such a great leader to serve on the board that oversees the city’s public works. After the jump below, L.A. Creek Freak links you to LID background, posts Green L.A. Coalition’s announcement, and highlights LID’s next steps. Late last week, the city of Los Angeles released its draft maps for its update to its Bike Plan. Formerly called the Bicycle Master Plan (now just the Bike Plan) and last approved in 1996, the Bike Plan designates a city-approved network of bike facilities. These include on-street bike lanes, river/beach bike paths and shared-lane bike routes. You’ve probably already guessed that L.A. isn’t bike paradise and that the plan isn’t going to get us there tomorrow (and even that the bike planning process hasn’t been as committed, thorough and transparent as it might have been)… but, like the L.A. River plans, this is an important opportunity to take some steps in the right direction. What I expect that creek freaks will be most interested in are the plans for bike paths along our rivers and creeks. The bike plan calls for bike paths along the Los Angeles River, Arroyo Seco and Ballona Creek which have been in past plans for quite a while. It shows new bike paths along portions of the Tujunga Wash, the Pacoima Wash, Aliso Canyon Wash and more of Brown’s Creek – all San Fernando Valley tributaries of the L.A. River. But there are plenty more Valley tributaries missing… like Bull Creek, Caballero Creek, Arroyo Calabasas, Bell Creek, and others. Another omission is that some of the bike lanes planned for the Cornfield Arroyo Seco Specific Plan are shown as “unfeasible.” This is, hopefully, just a matter of the department synching up their various plans. Luckily, it’s still a draft and the city is asking for our input, so if you’re interested, take a look at the draft plan maps, and submit your comments to the City Planning Department. And if you’re looking to get some first hand exposure to our local river bike paths… plan to ride the Los Angeles County Bicycle Coalition’s Los Angeles River Ride – THIS SUNDAY! There are various distances for the occasional rider to the hard-core centurion. See you there! You are currently browsing entries tagged with city of Los Angeles at L.A. Creek Freak.